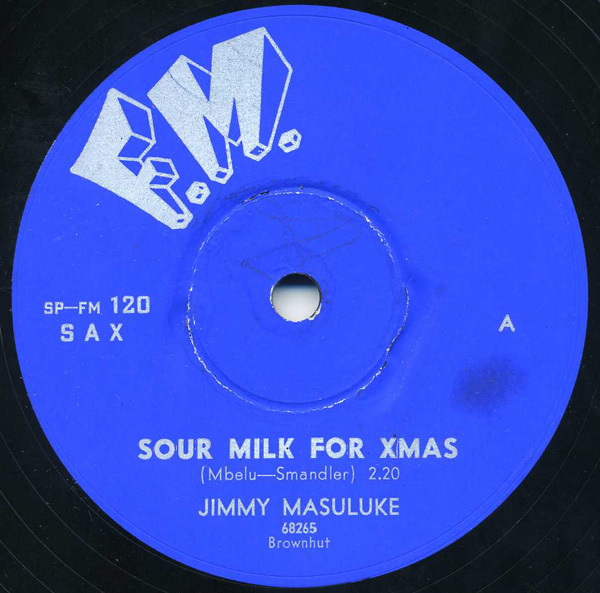 Here’s a bit of holiday nonsense, as promised, in the form of a goofy sax jive from South Africa, from sometime in the mid- to late 1960s. There’s not much else to say, except that it has a pretty solid chunka-chunka guitar riff going for it! F.M. was yet another in a stable of South African independent labels in operation during the 60s (see the Trutone Dolls track on this site), which also included Tempo, Winner, Stokvel, and Tee-Vee among others. All were in competition against the majors, being Columbia, H.M.V., and the large South African independent, Gallotone (with it’s subsidiary, New Sound). Incidentally – Matsuli must have this record too, as he used the flip side, “Happy Happy Make It Snappy,” on a mix he made in 2006. The mix itself is no longer available, but you can check the tracklist here! Thanks for posting another South African 78 Jonathan. But no I don’t have the record, only a copy of the cassette Flying Rock where the b-side appeared. It was passed on to me by Mark at Honest Jons some time back. silly or not, that friggin guitar sound is incredible, it almost sounds like the ruts… totally great!